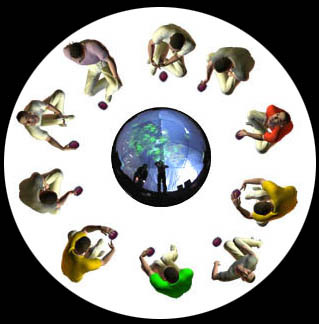 SphèrAléas is made of a half-spherical structure and of an evolutionary device wich makes man, image and sound interact thanks to digital tools. SphèrAléas is ideal for collective performances. It’s a safe space of oneiric creations in which the public creates, handles, juxtaposes, superimposes sonorous, pictural shapes unstable and reactive. Like for the learning of a musical instrument, people must take time to experiment it. Collectively, they must pay particular attention to compose a melody. Spectators are sitting around a hearth which is materialized by a hemispherical mirror. They can manipulate sensitive device in order to create visual and sonorous symphonies. By manipulating the sensors, the spectator-musician can continuously intervene on the whole structure by playing with the different variables: order, side-by-side positioning, overlapping, speed, rhythm, harmonic pitch… It is a kind of orchestra : there is a conductor who guides musicians, and coordinates the organization of visual and sonorous objects. The scenography is designed for complete immersion of the spectator thanks to interactive sensors, a multipoint sound diffusion, a video projection system (180°), within a half spherical membranous architecture. This original shared experiment becomes a poem of sensations: inside this womb-like space, sensitive perceptions are amplified, modified until a multitude of unexpected metaphorical worlds resonate. Designed for real-time musical and visual interactions, the immersive space is a semi-transparent half-sphere, 2.50 meters-high (8.2 feet-high). This structure is used as a screen for wide-angle projection similar to that of planetariums. Then the audience can be totally immersed in unreal and captivating atmospheres. Speakers and amplifiers make possible games of spatialisation of sound. 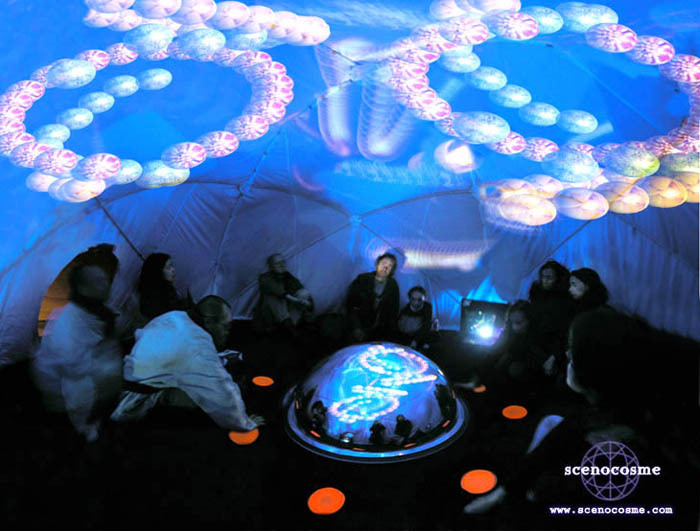 Inside the dome, the audience, seating or lying, can manipulate sensitive device and sensor sensors or simply daydream. 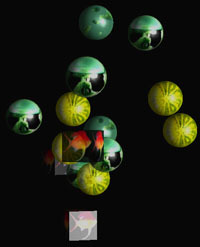 These manipulations are interpreted by the Aléas software which produces the sound and the 3D compositions. By mixing these image and sound structures, like an orchestra, spectators create symphonies to contemplate. Aléas arose from a reflection about how to materialise/draw sound with 3D images. It is a synthesis software, treating sounds and abstract images, able to create a dialogue with reality by using tactile sensors. It creates therefore an interactive, sensitive relationship with the audience. By positioning new materials, users create sustained melodies made of rhythmic relationships animated by subtle temporal intervals. Each user appropriates the system by creating particular processes of repetitive polyphony where parts overlap then disappear into hypnotic swirls. The audience determines the future of the work by experimenting with infinite orchestrations. They control easily the melodie thus generated.